Love to look great but worry about the impact of what you buy on planet earth? Fashion-Conscience could be the perfect store for you. With a Fashion-Conscience voucher you can enjoy great savings on a wide range of ethical fashions for men and women. So whether you're looking for an elegant new dress for a formal occasion or some comfy casuals for relaxing, a Fashion-Conscience discount code means you'll never need to choose between style and ethics again. Founded in 2007, Fashion-Conscience was established to provide an accessible online marketplace for stylish women with a conscience. It was started up by a former fashion and celebrity journalist for the UK's high-end glossy magazines, who found herself concerned about global issues and global rights. Wanting a place where she could find stylish, fashionable clothes that didn't involve compromising her ethics and values, the idea for Fashion-Conscience was born. The team at Fashion-Conscience are dedicated to hunting down the hippest, most style-led ethical fashion from amazing design talent from around the world. They believe that caring about where your clothes comes from is one of the most important factors in being a fashionista, and make it easy for followers of the latest trends to buy beautiful, quality clothing without giving money to sweatshops or unethical brands. Their designs are sourced from both established and emerging designers from as far afield as the USA and Brazil as well as the UK, and their prices are surprisingly affordable – meaning that everyone can afford to make the right fashion choices. At Fashion-Conscience's comprehensive online store customers can browse a wide range of ethically-sourced clothing and accessories for women, men and children – all available to browse by category or by brand, so it's easy to find exactly what you're looking for. Searching for a new outfit that's free from exploitation and unethical practice? You'll find plenty to choose from, whether it's a pretty dress for a summer wedding or a casual t-shirt for heading down the gym. Or perhaps you want that perfect bag, scarf or pair of shoes to complete that new look? At Fashion-Conscience they've got something to suit every budget and taste. Fashion-Conscience is also committed to resolving the issue of textile waste, supporting designers who craft clothing from recycled materials and focusing on high quality clothing that will last and last. Once you've chosen the right products for you, you can take advantage of Fashion-Conscience's fast and efficient delivery service to ensure your order arrives at your doorstep in record time. Want to get shopping with Fashion-Conscience? With a Fashion-Conscience voucher you can enjoy great savings on their fantastic selection of ethical clothing. So whether you're looking for a whole new wardrobe or just a few key pieces for the new season, a Fashion-Conscience voucher code will help you look great for less. Browse our website until you find a Fashion-Conscience voucher that suits you, then navigate to their website to begin shopping. Enter your Fashion-Conscience voucher code in the box provided and click 'Apply voucher'. Want to find out more about ethical fashion with Fashion-Conscience? Why not pay a visit to the company's dedicated YouTube channel? You'll find lots of exclusive content including fashion show videos, styling advice, tips on making your own clothing and more. You can also use this channel to find out more about saving money with a Fashion-Conscience voucher code. If you've enjoyed shopping with Fashion-Conscience, you might also like to check out more great deals on clothing and more at stores like Topshop or Debenhams. Or, if those aren't up your street, you'll find plenty more deals to browse in our Fashion, Accessories and Jewellery section. Enter your Fashion-Conscience discount code in the box provided and click 'Apply voucher'. Enter your payment details and click 'Place order now' to complete your purchase. Standard UK delivery is free on all orders over £100. For orders under £100, a delivery charge of £4.95 applies. If you need to return a product for any reason to Fashion-Conscience, you can do so by simply emailing returns@fashion-conscience.com and arranging to return your items within 14 days of receipt. Need to speak to the team at Fashion-Conscience? Whether you have a question about your order, want to know more about ethically-sourced fashion or simply want to find out how you could make big savings with a Fashion-Conscience voucher, you can contact the Customer Services department by accessing the online contact centre here. Want to discover more from Fashion-Conscience? The company maintains a profile across all your favourite social media networks. Follow them for access to lots of interesting content including special offers, collection previews, competitions and more. You can also use these pages to find out more about saving money with a Fashion-Conscience voucher code. Don’t forget to check them regularly, as you can never be sure when a free Fashion-Conscience discount code might be waiting for you! Buy now online at www.fashion-conscience.com. I love to buy new clothes, but I worry about the impact of the industry on the world around me – and ethical fashion can be so expensive. That's why I was so happy to discover a Fashion-Conscience voucher online. 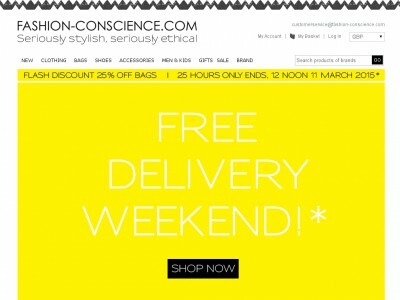 With a Fashion-Conscience voucher you can get great deals on a wide range of responsibly-sourced clothing and accessories at fashion-conscience.com. I used my Fashion-Conscience voucher code to get a great deal on a beautiful fair trade dress for my friend's wedding. So why not use some of the voucher codes?